Cluiche litrithe agus stráitéiseach atá sa chluiche Crannóg©. Is féidir le himreoirí d’aon aoisghrúpa nó cumas teanga, an cluiche a úsáid, ach tá feidhm ar leith ann dóibh siúd atá ag iarraidh litriú agus focail nua a fhoghlaim. Imrítear an cluiche le 2 go 4 imreoir ag iarraidh trí phíosa imeartha a thabhairt ón bhaile go dtí crannóg i lár locha. Caitheann na himreoirí ocht ndísle ar gach seal imeartha, agus déanann siad iarracht focail idir 1 go 8 litir a chruthú leis na litreacha ar na díslí. Bogtar na píosaí imeartha de réir fad na bhfocal a chruthaítear, timpeall an bord imeartha ach ní mór d’imreoirí roghanna a dhéanamh focail bheaga nó focail níos mó a dhéanamh chun céimeanna píonós a sheachaint, nó chun buntáiste a bhaint as céimeanna eile ar an bhord.Cluiche an-úsáideach atá anseo, chun cuidiú le litriú. Imrítear an cluiche le hocht ndísle 12 taobhach, a thugann rogha de 96 litir ar gach seal. Is annamh nach mbeidh imreoirí in ann focal a chruthú. 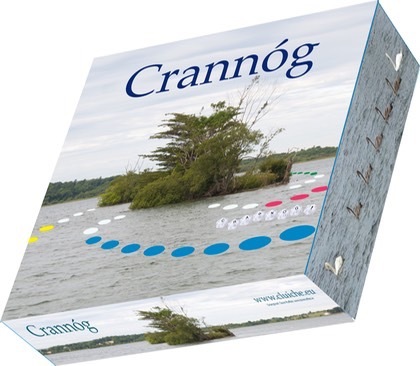 Crannóg© is an Irish language spelling game which involves some strategic thinking. Players of any age group, or language ability, can play the game but it will be a very enjoyable game for those wanting to extend their vocabulary, or use the full range of their vocabulary. The game is played by 2-4 players whoc are trying to move three playing pieces into the crannóg in the centre of the board. Each player takes turns at throwing eight dice and attempting to create a word from the eight letters shown on the upper face of the dice, moving their pieces according to the word length created. As players move their pieces, they must decide whether to spell long or short words so as to take advantage of penalty or bonus steps on the journey. This is a very useful game to help with spelling. The dice are 12 sided, giving a choice from 96 letters on each throw. On almost every throw players will be able to create a word.